Exporting AMF mod with multiple songs yields only the first one. However, upon exporting to flac only the first one is converted. I can get around this by manually choosing from pattern 0 to the last in the position fields, or the interval for a particular song. But I'm wondering, since OpenMPT detects the song boundaries automatically (I don't know how this works for the amf format), if it is possible to simply choose a song or export all of them to different files automatically. 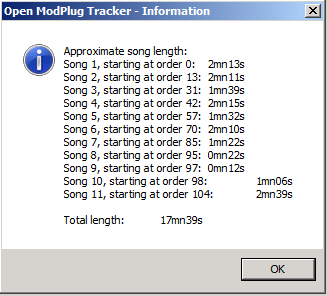 Re: Exporting AMF mod with multiple songs yields only the first one. You can convert each subsong into its own sequence, then you can use the export option with sequences to export all songs. That does mean you will have to turn it into an MPTM module first. Note that it might be easier to use the xmp-openmpt plugin with XMPlay, as this will require no manual steps and no format conversion, so it's most probably more desirable (converting an AMF file to MPTM might change some playback details).